Nothing says autumn like a fresh, crisp, juicy pear — from Florida. Yes, pears grow in the northern part of our state! Farmer Ara Morenberg recently delivered five bushels of two different varieties of heritage pears from 3 Rivers Farm. Her fruit is available at several local farmers markets this week, and online from Bee Heaven Farm. 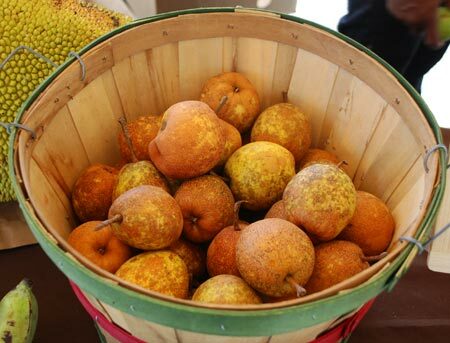 These Florida pears don’t look like your typical grocery store pear. 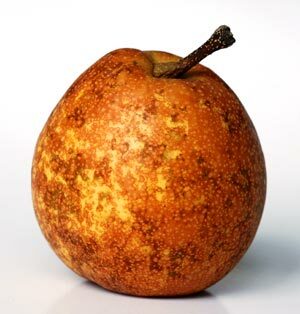 They are shaped much like an apple, and their skin is spotted similar to an Asian pear. They stay hard when ripe, with only the slightest give. Their flesh is crisp and juicy and only slightly sweet, not meltingly soft and sugary like a Bartlett pear. 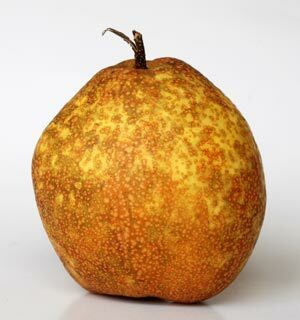 In fact, these old Florida varieties are a hybrid of Asian and European pears, bred for disease resistance. 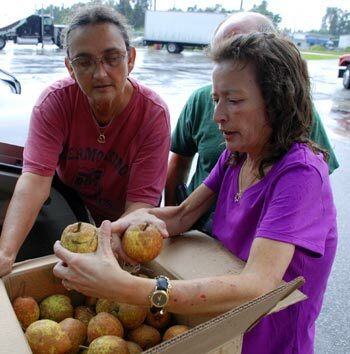 Ara (right) explains the differences between two kinds of pears to Margie (left). Of the two varieties that came this week from Ara’s farm, Hood might not be one of them. A quick internet search revealed that Hoods are light green, do have the typical long neck, but don’t have reddish-brown spots. However they could very likely be Pineapple pears, which match having a short-necked shape and spotted color, and have a bit of tartness to their flavor. They are huge for pears, about the size of a softball. And… they could be sand pears, or at least that’s what Farmer Margie Pikarsky was told when she was selling them at the Pies & Thighs pie contest on Saturday. She told me that “a couple of people, upon seeing them, immediately exclaimed ‘Sand pears! I grew up with these!’ ” They are called that for their gritty, hard texture. Sand pears (pyrus pyrifolia) could be any of several varieties commonly grown over 100 years ago in the old South. Whatever the names and cultivars, Lake City folk call them canning pears. “What they mean by that is that they can be cooked with,” Ara explained, “and they don’t eat them fresh, but instead baked, relishes, chutneys, canned, etc.” I found an easy recipe for apple tart that could be used with sand pears instead. Or you can skip the formalities and eat them raw, and enjoy their mildly sweet flavor as is. I cut up a sand pear and put it in chicken salad, instead of using apple or celery, and it added crunch without any obvious, strong flavor. Delicious, nameless, ancient pears of mystery and delight! You can order online no later than 3 pm on Thursday Sept 15 from Bee Heaven Farm’s Summer Store. (Pickup in person at the farm or another location.) Or, look for them at the FIU, Verde Gardens and Upper Eastside farmers markets this week and taste a bit of old Florida history for yourself. FIU Farmers Market, Maidique Campus, 11200 SW 8th Street, Miami. Wednesdays, noon to 3pm. Homestead Harvest Market at Verde Gardens, 28000 SW 127th Ave., Homestead. Fridays 4 – 8 pm. Upper Eastside Market, NE 79th St. and Biscayne Blvd., Miami. Saturdays 9-2 pm. North Florida pears at Upper Eastside Farmers Market last Saturday.